Centre-pivot roof windows are operated via the top control bar, making it easy to open, even with furniture below the roof window. WHITE POLYURETHANE FINISH • Wooden core encased in moisture-resistant white polyurethane. The first choice for humid rooms such as kitchens and bathrooms. • No visible joints, so dirt can’t accumulate in the corners. • Maintenance-free, which is ideal for out-of-reach areas. • Thermally moulded timber core delivers improved insulation. This page states the terms and conditions under which you may use our Site. The Site is owned and operated by Davies Limited, is a private company limited by shares. Registered in Ireland No.227018. Registered Office: c/o Grafton Group plc, Heron House, Corrig Road, Sandyford Industrial Estate, Dublin 18. Davies are subsidiaries of Grafton Group plc. Your use of this Site constitutes acceptance of these terms and conditions. If you do not accept the terms and conditions, then you may not use the Site. Davies may revise these terms and conditions at any time by updating this posting. Any changes in these terms and conditions will be effective immediately when they are posted on the Site. We reserve the right at our discretion to change modify, and/or remove portions of these terms and conditions at any time. You should visit this page periodically to review the terms and conditions, because they are binding on you. Davies authorises you to view and download a single copy of the Material (as defined below) on the Site solely for your personal, non-commercial use. The use of the Site and the Material is entirely at your own risk. Changes are periodically made to the Site and may be made at any time. The contents of the Site such as text, graphics, images, photographs, code and other material ("Material"), are protected by copyright, trade mark and other laws in both Ireland and overseas. You must retain all copyright, trademark and other proprietary notices contained in the original Material on any copy you make of the Material. You may not reproduce, display, publicly perform, distribute,sell or modify the Material or otherwise use the Material in any way for any public or commercial purpose or otherwise in breach of these terms and conditions. In particular, the use of the Material on any other web site or in a networked computer environment for any purpose is prohibited. All trademarks, service marks, and trade names are the property of Davies or its suppliers. The Material may contain inaccuracies or typographical errors. Davies makes no representations about the accuracy, reliability, completeness, or timeliness of the Material or about the results to be obtained from using the Site or the Material. In particular, while Davies makes every effort to ensure that the colour options available on the Site are representative due to colour restraints on the web, these colours may vary depending on the browser, hardware platform and resolution of your monitor. If you violate any of these Terms, your permission to use the Material automatically terminates and you agree to immediately destroy any copies you have made of the Material. The following provisions set out Davies entire liability (including any liability for the acts and omissions of its employees, agents or sub-contractors) to you in respect of: (i) any breach of the contractual obligations arising under this Agreement; and (ii) any representations, statements or tortuous act or omission (including negligence) arising under or in connection with this Agreement; (“Event of Default”). This Agreement does not prejudice the statutory rights, which you may enjoy if you are dealing as a consumer within the meaning of Irish law. Davies shall have no liability to you in respect of any Event of Default unless you shall have served notice of the same upon Davies as soon as reasonably practicable after the date on which you became aware of the circumstances giving rise to an Event of Default or the date when you ought reasonably to have become so aware. Davies shall have 30 days from the date of such notice in which to remedy an Event of Default hereunder. Davies shall not be liable and shall not otherwise be deemed to be in breach of this Agreement for any failure to perform (or delay in performing) any of its obligations hereunder caused by circumstances beyond its reasonable control. Davies does not warrant that the Site will operate error-free or that the Site and its servers are free of computer viruses and other harmful elements. If your use of the Site or the Material results in the need for servicing or replacing equipment or data, Davies is not responsible for those costs. The Site and Material are provided on an "as is" basis without any warranties of any kind. Davies and its suppliers, to the fullest extent permitted by law, disclaim all conditions and warranties, express or implied including any terms as to merchantability and fitness for particular purpose. Davies and its suppliers make no warranties about the accuracy, reliability, completeness, or timeliness of the material, services, software, text, graphics or links. In particular, Davies does not warrant that the use of the Material by you will not infringe third party rights. In no event shall Davies, its suppliers, or any third parties mentioned at the Site be liable for any damages whatsoever (including, without limitation, incidental, special and consequential damages, lost profits, lost goodwill or damages resulting from lost data or business interruption) resulting from the use or inability to use the Site or arising from the use, repair, service or maintenance of any equipment,whether based on statute, contract, or any other legal cause and whether or not Davies is advised of the possibility of such damages. That any information provided by you will be true, accurate, current and complete; and confirm that you are the authorised holder of any credit/debit card you may use on the Site; to notify us immediately of any changes to any information you have submitted to the Site; and to be available for delivery and to take delivery of any products ordered by you from the Site. Each product is sold subject to its individual product description which may set out additional specific terms and conditions related to that product including without limitation terms and conditions concerning estimated delivery times. Davies does not accept responsibility for inaccurate content and/or safety instructions, which are included on any products supplied. 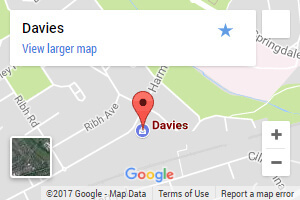 PLACING YOUR ORDER WITH DAVIES. Any order made by you shall be deemed to constitute an offer to purchase. No contract shall exist between you and Davies for the sale by it to you of any product unless and until Davies accepts your order by email. That acceptance shall be deemed complete and shall be deemed to be effectively communicated to you at the time Davies sends the email to you (whether or not you receive that email). Any such contract will be deemed to have been concluded in Ireland and will be interpreted, construed and enforced in accordance with the Laws of Ireland. While every effort is made to ensure the availability of products and to fulfil all orders, Davies cannot guarantee the availability of any product displayed on the Site. Davies reserves the right to discontinue the sale of any good or service listed on this Site at any time without notice. Promotional offers at Davies retail outlets may not always be available on the Site and promotional offers listed on the Site may not always be available at Davies. Davies cannot confirm the price or availability of a product until your order is received. Our goal is to maintain a completely accurate Site. In the event that price or other errors are discovered we will promptly correct them and the amended provision will apply. Davies reserves the right to change or amend prices or promotional offers at any time without notice. Prices are displayed in € euro and are valid in the Republic of Ireland only. Prices are inclusive of VAT at the current rates but do not include delivery charges. These will be notified to you and applied after you select your shipping method. Any orders in excess of €470 shall not incur a delivery charge. Promotional prices (where the previous price is struck through) indicate that these prices were listed at the original price for at least 28 days prior to this reduction. Davies accepts VISA, LASER, MASTERCARD & MASTERO & Payments through PAYPAL. Davies uses SSL to securely transmit your Credit Card information to our Merchant Acquirer. Customer Credit Card Information is not stored by Davies on our servers. SSL (Secure Socket Layers) is a method of transmitting information over a 128 bit encrypted link between two secure servers. Davies server is certified secure by Verisign. Davies will endeavour to have your product delivered within three working days, for example an order placed on Monday would normally arrive on Wednesday and an order placed on Friday would normally arrive on Tuesday. All goods are physically checked by our staff prior to dispatch. We regret that at present we cannot deliver on Bank Holidays or weekends. We are unable to accept orders for delivery from outside the Republic of Ireland or to islands surrounding the coast of Ireland. While Davies will endeavour to meet our delivery estimates, Davies cannot guarantee delivery within these time frames and we will not accept responsibility if your order is delivered outside the three day time frame. We would strongly recommend that you do not arrange for tradesmen to carry out work on your behalf until your order has actually been delivered. Title to the goods will only pass when delivery is acknowledged by a valid signature from a member of your household who is 18 years or over. Davies will accept the return of any product which is in its original condition and packaging and in the opinion of Davies is re-saleable. In order to return goods, please contact the e-Store by email at info@davies.ie or contact our telephone Helpline 01 8511700 quoting your order number. The courier company will then be issued with an Authorised Return Label instructing them to collect the parcel from your address and return it to the Internet store. Replacement products will be charged (including delivery) until the returned product has been received in a re-saleable condition. If we agree to provide you with a refund we will instruct our Merchant Acquirer to credit your credit card account within 30 days of receipt of the returned product. As our Visual Tips are a recording, any references on screen to competitions, prices, special offers, weather updates, or any other news information are 'time sensitive' and subsequently no longer valid. The Site contains links to third party Web Sites. These links are provided solely as a convenience to you and not as an endorsement by Davies of the contents on such third party Web Sites. Davies is not responsible for the content of linked third party sites and does not make any representations regarding the content or accuracy of materials on such third party Web Sites. If you decide to access linked third-party Web Sites, you do so at your own risk. Any disputes or questions relating to merchandise from linked sites or fulfilment or delivery thereof and its quality, suitability and fitness for purpose shall be directed to the vendors and you acknowledge that Davies and its affiliates, related or subsidiary companies shall have no responsibility, obligations or liability in relation to such merchandise. Davies generally welcomes the hyper-linking to the Site from other appropriate Web Sites provided such links are to the Site’s homepage (and no deeper within the Site) and provided Davies gives its consent to the establishment of such links. Notwithstanding the foregoing, Davies reserves the absolute right to refuse to consent to such links without giving reasons. Any links to the Site from another Web Site must be presented in such a manner that the viewing of the Site is not impaired by framing or similar techniques that may impair the visitor’s user experience. The aggregate liability of Davies to you for all claims arising from the use of the Site is limited to €63.49 and you acknowledge that this is a genuine pre-estimate of any loss you might suffer as a result of such a claim. You agree to defend, indemnify, and hold harmless Davies, its officers, directors, employees and agents, from and against any claims, actions or demands, including without limitation reasonable legal and accounting fees, alleging or resulting whether directly or indirectly from your use of the Site or Material (including Software) or your breach of the terms of this Agreement. Davies shall provide notice to you promptly of any such claim, suit or preceding and shall assist you, at your expense in defending any such claim, suit or proceeding. Davies respects your right to privacy. As part of the e-store facility Davies will retain certain information including your name, address, phone numbers, e-mail address, IP address, billing address and shipping address and product selection. 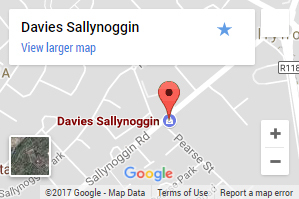 This Site is controlled and operated by Davies from its location in Ireland. Davies makes no representation that materials in the Site are appropriate or available for use in other locations. Those who choose to access the Site from other locations do so on their own initiative and are responsible for compliance with local laws. Any disputes, claims or proceedings arising out of or in any way relating to the Site shall be governed by the laws of Ireland. The Irish Courts shall have exclusive jurisdiction for the purpose of any proceedings arising out of or in any way relating to the Site. Without prejudice to the foregoing, Davies may seek provisional or protective relief in the courts of another State prior to during or after any substantive proceedings have been instituted in Ireland and Davies may bring enforcement proceedings in another state on foot of an Irish judgement. If any provision of this Agreement is found to be invalid by any court having competent jurisdiction the invalidity of such provision shall not affect the validity of the remaining provisions of this Agreement which shall remain in full force and effect. No waiver of any term of this Agreement shall be deemed a further or continuing waiver of such term or any other term. This agreement constitutes the entire agreement between you and Davies with respect to the use of the Site. Davies may at any time and without liability modify, suspend or discontinue the Site or any Materials (or any part or specification thereof), with or without notice for any valid technical, operational or commercial reasons. © COPYRIGHT DAVIES LIMITED 2013. ALL RIGHTS RESERVED. Product List - We Offer the largest selection of bathroom and household equipment in Ireland. Knowledgeable Staff - Our staff are 100% knowledgable in these areas and will be sure to help you with any questions. We respect your privacy. We don’t disclose your personal information to 3rd parties, ever. Thousands of satisfied customers. We’ve been in business since 1933. We’re still around thanks to thousands of happy customers. If you have bought items online at davies.ie and would like to return them, the ‘first step’ is to contact our Online Store at info@davies.ie or CALL 01 8511700 quoting your ‘Order Reference Number’. 1. If you received your online delivery from ‘An Post’ we will issue you a Returns Label so you can post the item back from your local An Post Office. 2. If you received your online delivery from our ‘Independent Transport Company’, they will be issued with an 'Authorised Return Label' instructing them to collect the parcel from your address and return it to the Davies Online Store. 3. You will only be refunded your ‘delivery cost’ if the return is as a result of our error. 6. Davies are happy to accept any ‘online product’ return as long as it is in its original condition and packaging is re-saleable within 30 days of purchase. Replacement products will be charged (including delivery) until the returned product has been received in a re-saleable condition. You will only be refunded your delivery cost if the return is as a result of our error (e.g. faulty product or incorrectly shipped). If we agree to provide you with a refund we will instruct our Merchant Acquirer to credit your credit card account within 30 days of receipt of the returned product. Your statutory rights are not affected. Please note: If you are returning a faulty item within warranty with a receipt, then you may be entitled to a repair. If it can’t be repaired you may be offered a replacement and if it can’t be replaced you may be offered a refund. With the nature of any faults, each case will be dealt with on an individual basis.